Preheat oven to 160°C (325°F). Place the butter, caster sugar and vanilla in the bowl of an electric mixer and beat for 5–6 minutes or until pale and creamy. Scrape down the sides of the bowl and add the eggs, one at a time, beating well after each addition. Add the flour, almond meal and milk, and beat on low speed until just combined. Spoon the mixture into a lightly greased, 10cm deep, 20cm round cake tin, lined with non-stick baking paper. Cook for 1 hour 20 minutes–1 hour 25 minutes or until cooked when tested with a skewer. Allow to cool in the tin for 15 minutes before turning out onto a wire rack to cool completely. To make the ricotta icing, place the ricotta, icing sugar and vanilla in a food processor and process until smooth. Refrigerate for 20 minutes or until lightly firm. To assemble, trim the top of the cake and discard. Slice into 3 layers horizontally. Using an 18cm round plate as a guide, use a small knife to trim the edges of the cake and discard. Place the raspberries in a small bowl and lightly crush with a fork. Add 1 cup of the ricotta icing and mix gently to combine. Place ⅓ cup of the pistachios into a small bowl, add 1 cup of the ricotta icing and mix to combine. Place the bottom layer of the cake on a cake stand and spread with the pistachio ricotta icing. 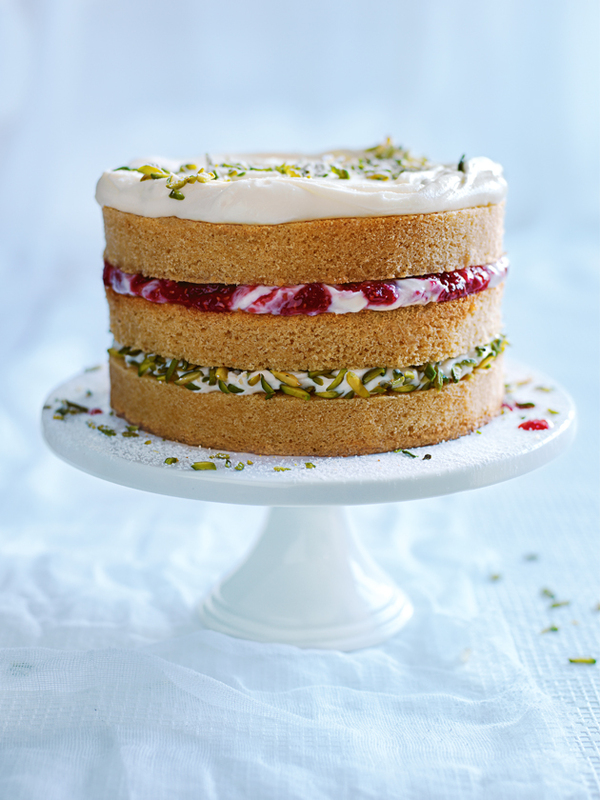 Top with a layer of cake and spread with the raspberry ricotta icing. Top with the remaining layer of cake and spread over the remaining ricotta icing. Sprinkle with the remaining pistachios to serve. Serves 8–10.